Shop Infusium 23 Moisture Replenisher Leave-In Treatment Spray (13 oz. )13 oz. 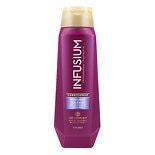 Shop Infusium 23 Moisture Replenisher Shampoo (13.5 oz. )13.5 oz. $849$8 and 49 cents$0.63 / oz. Shop Infusium 23 Moisture Replenisher Conditioner (13.5 oz. )13.5 oz. Boost your confidence and get a salon look every day with Infusium 23 hair-care products. 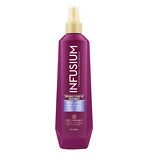 Start your hair-care routine with Infusium 23 Pro-Vitamin Shampoo. Its specially designed formula contains just the right amount of moisturizers and nutrients to promote healthy, manageable hair. 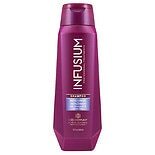 To repair damaged hair, use an infusium 23 leave-in treatment. Unlike most conditioners, these treatments continue working all day to prevent breakage, provide nourishment and rejuvenate your hair. Over time, harsh styling products cause hair to become dry, brittle and damaged. Unhealthy hair appears frizzy and is difficult to style properly. Choose a shampoo and conditioner that help moisturize, rejuvenate and prevent further damage to your hair. Select an Infusium 23 product that represents your desired result, and use it every day for noticeably rejuvinated hair. For more severe damage, add a leave-in treatment to your hair-care routine; this allows the pro-vitamin formula to penetrate the hair follicles and provide long-lasting softness and shine.